If you’re in the mood for some light yet satisfying summery fare, and you’re a big fan of feta like us, you have to try this awesome Greek-inspired grilled chicken! It’s a snap to throw together for dinner on a warm weeknight after work, or to make a little extra for that weekend barbeque with friends. Friendly on the waistline, this grilled dish delivers awesome flavor without adding to the belt-size – and it’s a great way to get the kids to eat their veggies! We love adding pine nuts and currants to the spinach-feta mixture, and garnishing with a slice of lemon for a little extra Mediterranean zip! In a medium pan, cook onions, garlic, nutmeg, salt and pepper on medium heat, until onions are translucent. Remove from heat and set aside to cool. To butterfly the chicken breasts: With a sharp knife, make a lengthwise slit starting at the thickest side of the breast, leaving a 1/2 - 3/4 inch strip intact on one side. Open chicken breasts so they’re lying flat. When the onion mixture has cooled combine it with the spinach, feta, yogurt, salt and pepper in a small bowl. Spoon half of mixture over each butterflied breast and press chicken breasts closed, making sure the edges aren’t overflowing. Carefully coat chicken with olive oil and sprinkle with salt and pepper (or use red chili flakes instead of pepper). 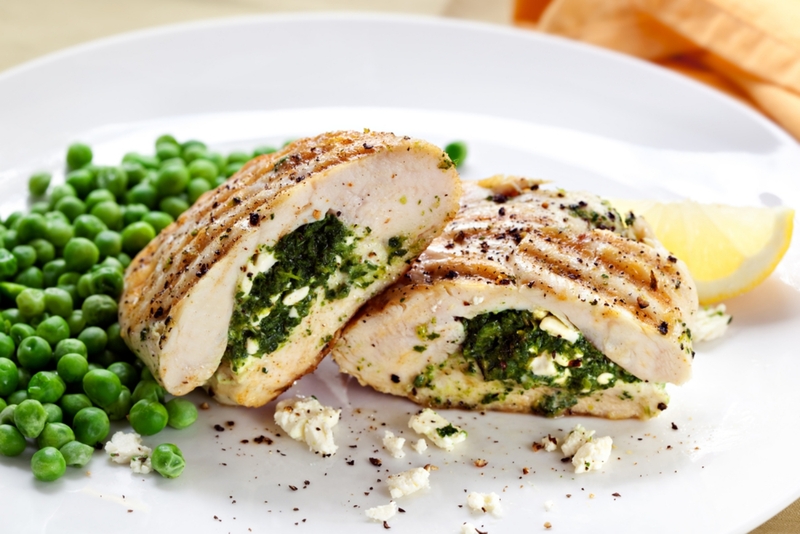 Grill stuffed chicken breasts for 5-6 minutes on each side, until golden. Let rest for 5 minutes and serve!